One of the country's three official languages, New Zealand Sign Language evolved in the communities that grew from networks of Deaf children at three schools for the Deaf from the late nineteenth century. The Dictionary of New Zealand Sign Language (1997) - now an invaluable onli... read full description below. One of the country's three official languages, New Zealand Sign Language evolved in the communities that grew from networks of Deaf children at three schools for the Deaf from the late nineteenth century. 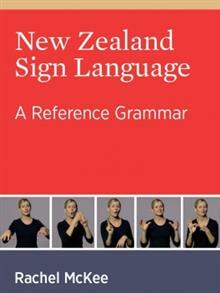 The Dictionary of New Zealand Sign Language (1997) - now an invaluable online resource at nzsl.vuw.ac.nz - and the Concise Dictionary of New Zealand Sign Language (BWB, 2003) were landmarks in documenting the language. A formidable body of scholarly research lies in these volumes, driven by the Deaf Studies Research Unit at Victoria University, led first by Graeme Kennedy and later by David and Rachel McKee. Today, NZSL forms part of the curriculum in intermediate schools, and New Zealanders are increasingly familiar with the language. Drawing on her experience of both teaching and researching NZSL, Rachel McKee has developed A Reference Grammar to support all those who are learning NZSL - students, families and friends of Deaf people, school teachers, public officials. This clear account of language structure and use is illustrated with dozens of videos (accessed via the ebook), drawings and photographs. Purchases of the print book include complementary access to the ebook - instructions are included in the print book on how to access the ebook. A Wellingtonian by choice, Rachel Locker McKee grew up in Hamilton. After graduating from Victoria University of Wellington in 1985, she joined New Zealand's first training course for sign language interpreters. This began a journey into the Deaf world, in which she has worked as an interpreter, researcher, writer and teacher. Rachel is Programme Director of Deaf Studies at Victoria University of Wellington. She has published a variety of scholarly articles relating to the Deaf community, linguistics and politics of NZ Sign Language, and sign language interpreting. With BWB, Rachel published People of the Eye: Stories from the Deaf World (BWB, 2001), an anthology of Deaf people's life histories, and contributed to publication of A Concise Dictionary of New Zealand Sign Language (BWB, 2002). She co-authored Sign Language Interpreting: Theory and Practice in Australia and New Zealand (Federation Press 2006, with J. Napier and D. Goswell).